Two essential features of a Christian Society are – first, a firm grip on the vital truths of our most holy faith; second, the flexibility which will permit of its adaptation to the social and temperamental conditions of different periods and places. That the Primitive Methodist Church possesses these qualities is seen in her success in such varied spheres as the agricultural counties, the mining districts, the manufacturing centres and the sea-faring populations of our country and also in her triumphs in the colonies and among the natives of Africa. Excepting the colonies, the writer has had some experience of our work in all these fields of labour. Coming to the Pudsey and Stanningley Station in 1916, opened out new channels of interest and effort. The name of the station is a little misleading. To the stranger it may suggest societies in two different and separate townships. The circuit consists, however, of three places in the small manufacturing town of Pudsey in the West Riding. 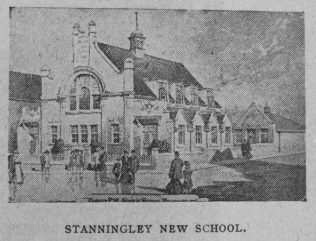 Whatever it may have been in the distant past, Stanningley today is only a name given to a postal area, a railway station and two municipal wards, one in Pudsey and the other in Leeds. The administrative affairs of Stanningley are divided between the City of Leeds, the Borough of Pudsey, and the Urban Council of Farsley. Pudsey and Stanningley Circuit is one of those neat arrangements which economise the minister’s physical force. Work can be found to occupy the energies of the most zealous, but it does not take the form of tramping or cycling along country roads. The churches are generally designated Pudsey, Stanningley and Roker Lane, but they are often referred to in the alliterative form of Robin Lane, Richardshaw Lane, and Roker Lane. The three “R’s” are ever with us. From the Stanningley Church a ten minutes walk in a straight line brings us to the one at Pudsey and another fifteen minutes walk in a straight line brings us to Roker Lane. To make matters still easier the minister’s house is conveniently situated in a pleasant position between the places. We are, however, still of opinion that the disposition to divide circuits has been carried to a point which, taken generally, is not helpful. Of Pudsey, a Pudseyite would write with enthusiasm. In fact one has written a comprehensive and interesting history of the place from the Saxon period. Situate on the hill, about half-way between Leeds and Bradford, Pudsey overlooks both of her great neighbours, and affords commanding views of the surrounding country. It is an accessible place, having three railway stations, viz. : Stanningley, Lowtown, and Greenside, and direct tram communication with the important cities mentioned. As Leeds and Bradford stretched out their hands on either side, Pudsey sought refuge in a Charter of Incorporation which was granted in 1900, being the last given in the reign of the good Queen Victoria. And so the little borough of 15,000 inhabitants is a buffer State. We trust that she will not experience the sad lot which has sometimes befallen the State in that position. 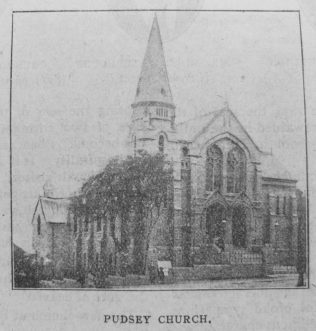 When the Primitive Methodists missioned Pudsey, they entered a place which had already a religious history. A recent bill announced that on a certain date the Congregational Church would celebrate its 256th Anniversary. The Moravian Settlement, so beautiful for situation, with its quaint old world appearance and important educational and religious work, has long been a centre of great interest. To-day there are sixteen places of worship, all substantial buildings, and some very handsome and commodious. The Parish Church is the largest but one in the Ripon Diocese. 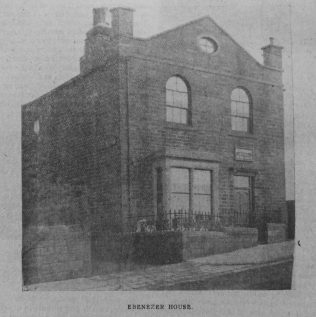 In 1833, the Primitive Methodists came singing and preaching from Bradford. 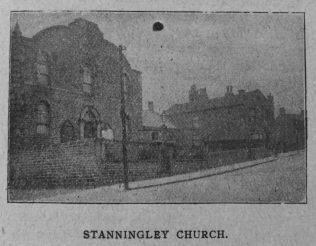 In 1834, regular services were established at Stanningley, and a year later a chapel was built in Richardshaw Lane. In 1839, the zeal of the Bradford pioneers was rewarded in the building of a chapel and school in Hammerton Street, Pudsey. From thence the two churches have bravely struggled onwards and gradually grown in strength and influence. Much might be said of the character and devotion of the early members and workers. 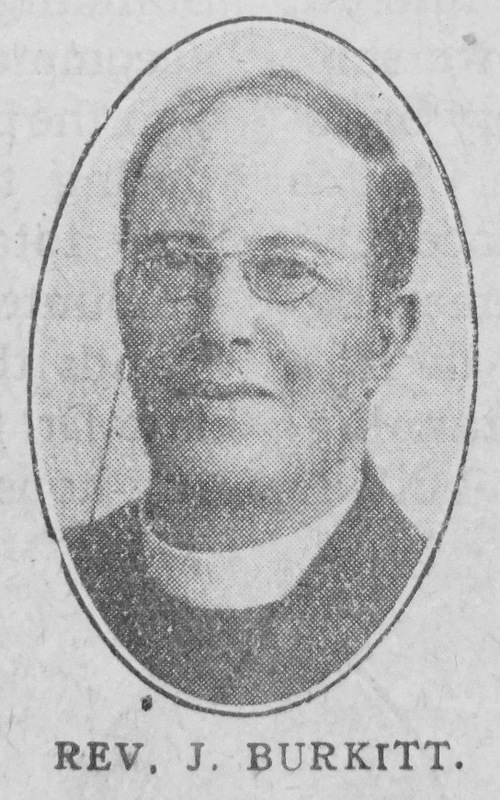 Foremost among those at Stanningley comes the name of Isaac Waterhouse, who for the last seven years of his life was a permanent member of Conference. He was a man of broad sympathies, wide outlook, strong religious character, and with a genius for friendship. 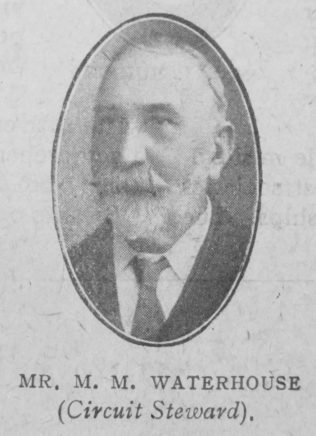 He enjoyed the personal friendship of many of our Connexional leaders in his day, and did much to secure the prosperity of Stanningley Society. Joseph Webster and Isaac Gatehouse were also good men and true, and the church owes much to their labours and self-sacrifice. Among the pioneers at Pudsey were Amos Old?eld, Dan Webster, William Waterhouse and Samuel Milner. An evidence of the religious spirit of those days is seen in the preponderance of Bible names. It comes down to present times. Our Circuit Stewards are Mr. Moses M. Waterhouse and Mr. Jonathan Coates. 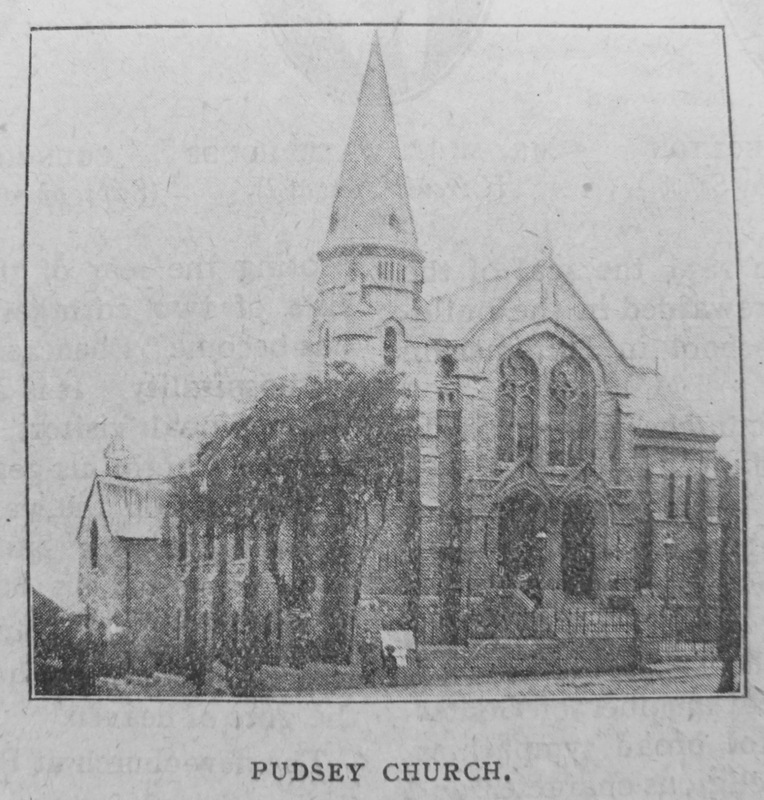 The new church at Pudsey was built in 1901 during the ministry of Rev. W. R. Wilkinson, and cost over £6,000. It is an excellent example of church architecture, both in respect to exterior and interior arrangements. It will seat 600 persons, and also has accommodation for 400 scholars. Roker Lane school-chapel was built in 1875, largely through the efforts of the late Mr. James Payne. 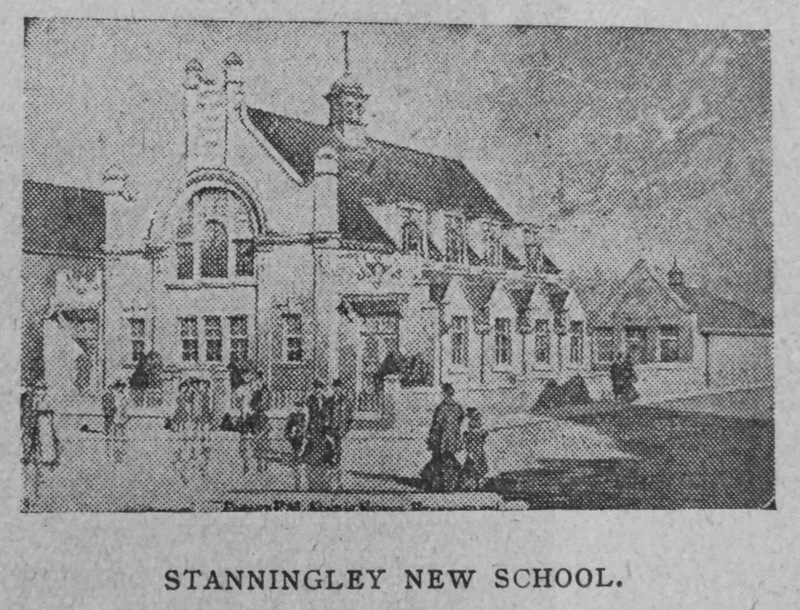 Although this circuit was founded mainly through the efforts of workers from Bradford, the Societies in time were transferred to Leeds, Stanningley going over in 1865, and Pudsey in 1872, when both were included in the newly-formed Leeds 5th Circuit (Bramley). In 1888, the, two societies were formed into a new station. Among the ministers who have laboured on the Station with ability and devotion are the Revs. J. Sharpe, A. B. Carter, Hezekiah Cooke, J. Pearson, and W. Robinson, who have passed to the higher service, and in addition to those mentioned, J. Hawkins, W. Shaw, Johnstone Dodd, and F. J. Hadfield, are still in service. We may not realise how much we owe, as ministers, to the labours of our predecessors, but every minister enters into a heritage of consecrated service without which his own work would be impossible. Keighley fills a large place in the church and in public life. His family have been brought up to love the church, and might form a society. About a year ago the municipality bought a new motor fire engine, and the Council unanimously resolved to call it “The John Keighley” in acknowledgement of his services. In pulpit, school and society stewardship, he serves the church with ability and devotion. The name of Mr. Jonathan Coates will always be fitted into the history of the Pudsey Church. His intense devotion and business ability are a powerful asset. 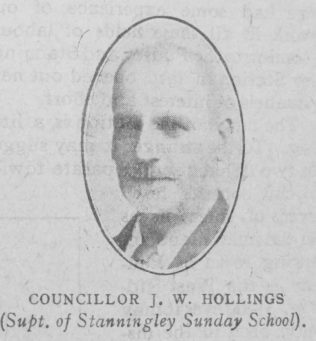 Councillor J.W. Bolton heads the school department at Pudsey, and brings to the office that spirit of good-natured continuity which assures success. “The Bolton family” fills a large place in the life and work of the church. Mr. S.L. Holdstock, Society Steward at Pudsey, is the son of Mr. Samuel Holdstock, for many years one of the most useful laymen in the Leeds District and is himself a tower of strength in virtue of his cheerful and untiring labours. The circuit may be small, but given such a band of workers, it cannot fail of a great future. On September 15th, of last year, an impressive service was held at Pudsey, when two memorial tablets were unveiled; one to the memory of the late Rev. W.H. Walton, a native of Pudsey, who entered our ministry in 1858, and was afterwards sent to Australia, where his missionary labours are still remembered with gratitude and affection; the other in memory of Mrs. Coates and Miss.Coates, mother and sister of our junior Circuit Steward, both of whom left a precious memory. From the Station about one hundred and sixty men have gone into military service. Several have made the supreme sacrifice, and one has won the D.C.M. At each place there is a Soldiers‘ and Sailors’ Comforts Fund Committee from which gifts and letters are regularly despatched, and by this means the church keeps in constant touch with the boys who are serving their country and civilisation. We might add, in conclusion, that the clergy and ministers of Pudsey are a happy fraternity, working loyally together as Christian brethren for the moral and religious welfare of the town, in organised efforts, outdoors in summer and indoors in the winter months, and meeting together monthly for devotional exercises and Bible study, the Primitive Methodist minister acting as secretary to their united efforts. We hope that the readers of the CHRISTIAN MESSENGER will find something of encouragement and interest in this brief sketch.